Hark, the world's first 'heavy metal' guitar! 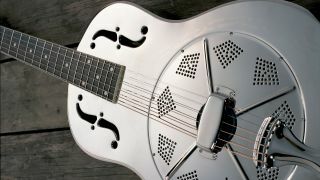 First designed by John Dopyera and George Beauchamp in the late 1920s, National resonator guitars were a solution to two problems plaguing guitarists. First, volume: prior to the invention of electric guitars, guitarists struggled to be heard above the noise of big bands. Second, fragility: traditional hollowbodies were not cut out for the rigours of touring. "A metal cone is fitted beneath the bridge, and resonates when the strings are picked, increasing the volume"
Beauchamp and Dopyera's choice of body material, metal, was an effective remedy for flimsiness. But their steampunkish volume fix was even more impressive, for National guitars achieved their awesome sound levels via a gadget based on the workings of a phonogram (that thing next to the dog in the HMV logo). A metal cone - or, as in the tricone design, three cones joined by a bar - is fitted beneath the bridge, and resonates when the strings are picked, increasing the volume. Dobro guitars, often confused with Nationals, were produced by Dopyera's Dobro Manufacturing Company shortly after he and George Beauchamp parted ways. National String Instrument Company is formed by Dopyera and Beauchamp. The single-cone type resonator guitar is patented by National. Production of National resonator guitars ceases. Production resumes under the name National Reso-Phonic.